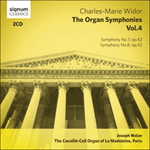 One of the highlights of the 1889 Paris Exposition, singled out in his Souvenirs autobiographiques (1935-36), was Widor’s performance at the Trocadéro, on 3rd July, of the Eighth and Fifth Symphonies—the one, according to Ménestrel, ‘severe and highly elevated in style,’ the other ‘completely appealing’. ‘With the Mahlerian scope of the […] Eighth Symphony,’ says Near, ‘Widor seems to have exhausted the possibilities of his instrument, as well as his own compositional technique. The Eighth represented the ultimate achievement in the art of organ composition’ by the end of the 19th century. ‘Severity at first sight’ (letter, 10 April 1887), it was to be ‘the capstone to his organ works’. In its original form the Eighth comprised seven movements. In the 1900-01 revision, the fourth, a Prélude in A minor/major (preparing for the ensuing Variations), was withdrawn. The opening 6/8 movement is nominally in sonata form in so far as it welds facets of exposition, development and recapitulation—but Widor refuses to be straight-jacketed by convention, expectation or prescription, exploring his material through a whole ebb and flow of sub-structures and dramatic tensions. Three ‘upward pointing’ anacrusis subject groups underline the first: A), a risoluto motif (falling octave led); B) a rising scale pattern (G sharp minor); C) a ‘halting’ phrase (interval led). These are then worked through in turn, with A functioning as a pseudo-rondo refrain—ABACA. On its final appearance A fuses reprise, development and coda into one. Ongoingly developmental, the ternary second movement is a vocally-intoned E major modéré à la Mendelssohn, encompassing some of Widor’s most gracefully lyrical invention and ‘orchestration’. Jules Delsart, in his youth a pupil of Chopin’s friend Franchomme, famously arranged it for cello and piano. It’s offset by a 2/4 B minor third movement that’s less fairy scherzo more relentless, Hexentanz—phantom horsemen, creatures of the night, demons of ill-omen menacing the sky … With the D minor Variations Widor celebrates at Bach’s altar, sculpting a twin-climaxed passacaglia of a magnificence and strength to equal the mightiest in Beethoven, Brahms and Bruckner. Near thinks it ‘may be the greatest movement of the symphonies’. Theme … eleven entries … interludes, extensions, asides—rigour—fantasy. Poised and shapely, crystallised out of an ascending bass recitative (the ghosts of Weber or Rossini lurking somewhere within perhaps), the subsequent F sharp major Adagio glimpses gentler pastures—many voiced, with a central fugato—couched in harmonic terms diversely piquant and dolce, complex and simple. Impelled by the falling F sharp octaves of the first movement’s opening, the 2/4 B minor finale is a large-scale ABACABA sonata-rondo. Albert Schweitzer didn’t like it: ‘what a shame that Widor wrote this!’ Riemenschneider, on the other hand (The American Organist, July 1925), admired its ‘almost barbaric splendour and exuberance’. A canvas of transcendental virtuosity and inexorable energy, organistically, pianistically, orchestrally imagined, its Eiffelsque girders and trellises, its shuddering currents of unassailable sound, silence men and move stones.